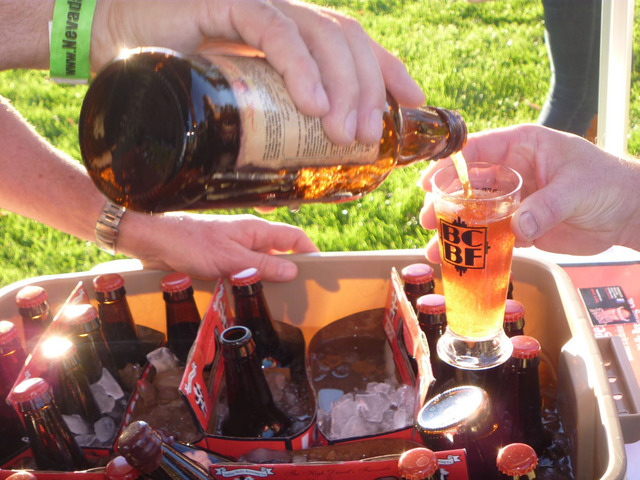 For brew guru Todd Cook, the Boulder City Beerfest is unlike any other. The beer tasting, the socializing and the lively atmosphere are how all beer festivals are, he said. But the Boulder City Beerfest will have two live demonstrations of how to brew beer, something that isn’t common at other beer festivals. “It’s something I haven’t seen at any beer festival before,” Cook said. UNLV food and beverage professor Jon Griffin will demonstrate how to make a lager, while two English brewers will demonstrate how to make an India pale ale. Nearly 30 vendors will have more than 60 beers available for tasting at the festival from 1-7 p.m. Saturday at Wilbur Square Park in downtown Boulder City. Cook said the most enjoyable part of the festival is the atmosphere. Three bands will play an assortment of music so thirsty patrons can enjoy the mix while slopping down some of Southern Nevada’s newest craft beer. Festival-goers can fill their bellies from five food vendors that serve barbecue, lobster rolls, deli sandwiches and Mexican dishes atop the hill alongside Park Street overlooking the festival. Michael Pfohl, director of development at Nevada Beer Project, said the mixture of older and newer brewing companies is what makes the Boulder City Beerfest unique. Banger Brewing and Luelling Orchard Brewing are two of the newest brewing companies in Southern Nevada. Both will be at the festival, along with Boulder Beer, Colorado’s first microbrewery that opened in 1979. Another aspect makes Boulder City’s Beerfest unique are the games, Pfohl said. The waiter relay, the keg stacking race and the team chug challenge will be in full effect for those who choose to participate. Although hundreds of guests will be guzzling, quaffing and chugging several pints of beer in the span of a few hours, Cook said he’s not concerned about safety being an issue. Festival-goers who buy VIP tickets can come to the festival at 1 p.m. Those who purchase general admission tickets have to wait until 3 p.m. to enter. The festival runs until 7 p.m.
VIP tickets are $45 in advance and $60 at the door, while general admission tickets are $30 in advance and $40 at the door. All tickets include unlimited tastes of the featured beers. Tickets can be purchased in advance at Boulder Dam Brewery Co., 453 Nevada Highway; Khoury’s Fine Wine and Spirits, 9915 S. Eastern Ave., No. 110, Henderson; or at www.bouldercitybeerfest.com. About half of the 1,500 tickets are already sold. Cook said even though the beer festival is all about the environment and having a good time, the most important thing to him is donating the proceeds to the Wounded Warrior Project, a nonprofit organization that aids injured service members.